The new two car garage located behind 116 Church Street is a modest development appropriate to the neighborhood and complements, but does not mimic the feeling of the existing residence. Access to the garage is from an alley so there was little change as seen from the front of the house. The garage maintains the flavor of the main house by using the same lap siding, divided light windows and “eyebrow” awnings over two windows as found on the side of the original house. Additional site work includes extension of a stone patio matching the same stone work as the original. A parking space to the side of the house was created using brickwork which is compatible historical material. An interesting feature includes the relocation of a carriage house which was located on the site of the new garage. This carriage house was found on an 1890 plat map. The original materials were all reused and additional support was added to the floor and roof and the addition of a window. The exterior paint was treated to preserve the old faded appearance. It is most obvious that the owners are sensitive to the historic nature of their neighborhood and gave careful thought to both the historic home and the Skidmore Academy Historic District in which they live. Jeanette Stewart loved her Historic Contributing Queen Anne cottage located at 155 Eighth Street, but was running out of room and longed for more space. The Eggleston-Davis house was originally built as a rental for Rebecca Eggleston about 1903. Miss Eggleston sold the home to George Davis, an Ashland shoemaker, in 1908 and the Davis family occupied the home for a number of years. The home retains a high level of integrity. Realizing this Ms. Stewart was very careful not to make any changes to her historic home which would compromise this. Working with Dan Heller as her contractor they came up with a design for an addition to the side which harmonizes perfectly with the existing historic structure. Everything from the roof to the foundation duplicates, as much as possible, the original materials and treatments. Ms. Stewart and Mr. Heller are to be complemented for a job well done which will add much livability to the home without alternating its historic character. Craig and Lisa Keffeler had a dream; after living in three large Western US Cities, Denver, Scottsdale and Los Vegas, they wanted to find a small beautiful community to retire in before they turned 50. After exploring many different places they visited Ashland and fell in love! Still young and employed Craig found employment and they moved into a rental while they looked for the perfect home: Within walking distance of downtown and with a lot large enough for Lisa to pursue her passion of organic gardening. After looking for months they found 111 Nursery Street which sits on a beautiful large lot close to town, but in a sorry state of repair. Originally built around 1905 the Charles S. Davis house is a 20th century American Bungalow. The property originally extended all the way to Coolidge Street. By the Second World War the property had been split into smaller lots leaving the home on the largest parcel. Dr. Cornel Sabo, a Medford dentist, owned and lived in the home with his family for many years, but by the mid 1950’s the home started loosing it’s original character with poorly done additions and remodels by a succession of owners. When the Keffelers found the home it was a foreclosure that had been owned by a contractor who planned to move the house to one side of the property and build an additional two homes. With Lisa Keffeler doing their design work and acting as an owner-contractor the home was restored to much of its original appearance. The botched additions and remodels were removed; the front and side porch restored, and a period appropriate addition added using historically correct materials. At the same time all of the systems were updated so that the home is energy efficient and functions like a new home. The home is now ready for another 100 years. Congratulations on a job well done! The Whitmore-Stemple house located at 355 Scenic Street was originally constructed in 1910. This Arts and Craft style bungalow was owned and occupied for nearly 60 years by its original occupants. The home has survived all these years without any additions or major construction renovations. Current owner Sam Whitford needed just a little bit more room, a second bathroom upstairs and a closet for a total addition of 32 square feet. The addition was done through the extension of an existing gable and by raising the roof line within that gable. The result is seamless, both indoor and outdoor materials duplicate the historic materials used. Matched moldings, antique light fixtures, and hand silk screened period appropriate wall papers were used. The new bath looks like it was always part of the home with a functional 1930 style plumbing renovation. This geographically modest addition was crafted with skill and care, though a small space, the intent was to create a harmonious and seamless addition, the owners were more concerned with historic preservation than sparing expense and it shows in the final product. This project was carried out through the efforts of architect Tom Giordano and general contractor Keith Swink of Eagle Harbor Design. Together with the owners, they have preserved a wonderful piece of Ashland history and enhanced its livability with sensitivity, care and historic harmony. Builder, and is an example of “Pole House,” Passive Solar architecture. Homeowners, John and Robyn needed the addition of a Garage, Home Office and Guest Room, and were already working with architect Richard Wagner, Richard Wagner Architects, for a small sensitive addition to the main house. They then proceeded with their architect to create this new separate building to incorporate these new facilities. Particular care was given to the relationship of this new building to the existing home in terms of siding, roof slope, massing, and detailing. This has resulted in a beautiful complement to this property and a gracious and welcoming area between the two buildings. Having responded to the definitions and constraints inherent with the sloping site and its existing architectural style, the handling of this addition now stands as a very positive example of a “historically compatible” addition in the Skidmore Academy Historic District. The Ashland Railroad Museum is a non-profit, volunteer-operated museum located on “A” Street in the Historic Railroad district. The Museum was founded by a group of dedicated historians, writers, artists, business people, and one steam engineer who strongly believed that Ashland Oregon deserved a history museum. With the importance of the railroad in Ashland’s history, they felt it should be a railroad museum. They also felt a railroad museum would be more sustainable, attracting a more diverse group of visitors – not only Ashland’s traditional tourists, but also locals and rail fans. They opened their doors on December 17, 2007, the 120th anniversary of Ashland’s Golden Spike, a celebration of the last link in the nationwide railroad system. The museum sponsors monthly lecture series, films and music concerts. They also coordinate “Tombstone Tales” a living history reenactment with 60 volunteers in the old Ashland Cemetery during Fourth of July. The Executive Director is Victoria Law. Her grandfather and uncle worked the railroad in Kentucky. 20 years ago she purchased the historic Swedenburg home on Gresham Street and history has consumed her ever since. 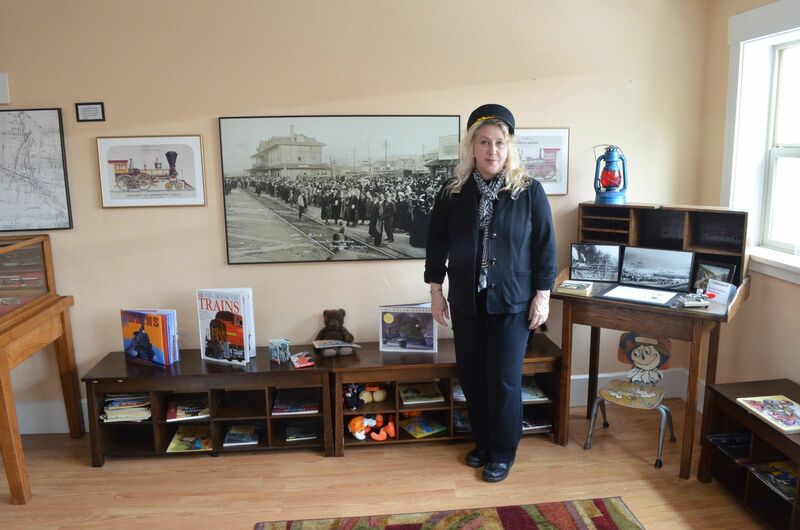 As a volunteer researcher for the Director of So Oregon Historical Society, Carol Samuelson put her in touch with 3 others who were railroad enthusiast. Larry Mullaly, a retired Rogue Community College administrator, writer and historian. His father was a railroad brakeman. Bill Ainsworth, is a ferroequinologist (study of iron horses), and a steam engine repairman for Yreka Western Railroad. Charles Beecham, Lieutenant Colonel USAF retired, was a railroad artist. He recently passed away at 90 years old, and after finishing his last painting of the Ashland Historic Railroad Depot, which is now hanging in the Museum. The other contributing members are Margery Winter, Scott Mangold and Gary Pederson. We honor the Ashland Historic Railroad Museum for their enthusiasm and commitment to the preservation of Ashland’s history. Please visit and discover this American Gem! The City of Ashland’s Historic Commission wishes to commemorate the Centennial Anniversary of the Ashland Carnegie Library Building. The construction for this historic building began March 1, 1912 and was dedicated on September 16, 1912. The noted philanthropist, Andrew Carnegie, donated $15,000 of the $16,500 construction budget. The original plans required for the donation funding were prepared by local architect, Frank Clark. Frank Clark’s design for the library was not utilized though as it likely did not meet the standards of Notes on Library Bildings [sic] written by Carnegie’s secretary James Bertram who had begun exercising significant power over the building design. Bertram’s book contained minimum standards and six model floor plans that provided the greatest amount of usable space consistent with his standards for good taste. It suggested a basement 9 to 10 feet high and 4 feet below natural grade and a second level 12 to 15 feet high. The most commonly adopted of the plans called for a main floor with an adult reading area on one side, a children’s area on the other, and the librarian’s desk between the two. The front door was located in the middle, opposite the librarian. The exterior was left to the discretion of the community but they were warned to not provide an overly ornate exterior. The original portion of the library met Carnegie’s criteria. As required to obtain the Carnegie grant, the library was originally owned and operated by the City but the operation was transferred to the Jackson County Library System in 1970’s. The building has experienced a number of renovations and expansions over the past 100 years due to the increases in population and services. The most recent was a large addition and remodel completed in 2003 by Sera Architects of Portland, Oregon. The original building represents the “American Renaissance” style which is typical of many Carnegie inspired projects of that era. The library building is uniquely sited, diagonally with the classical pediment entrance facing the intersection of Gresham and East Main streets. The original long flight of stairs leading to the traditional entry remains; however, these stairs were modified during the 2003 expansion to comply with current access requirements. The original building was brick, covered with exterior plaster and the interior was finished with Oregon fir. When the library was expanded the original historic portions were restored its original form and colors. The building is located within the City’s Downtown Historic District.